A Mannheim, Germany judge has tossed one of the myriad cases between Apple and Qualcomm, declaring that the iPhone isn't violating one of Qualcomm's power management patents. The judge ruled the suit in question groundless, declaring that Apple's iPhone wasn't standing in violation in an initial verbal ruling. A full filing with rationale is expected in the future, but it may not arrive for some time. The patent in question, EP2360270, covers power management in transistors, dates back to 2009, and was allegedly used without licensing for power management in the iPhone. 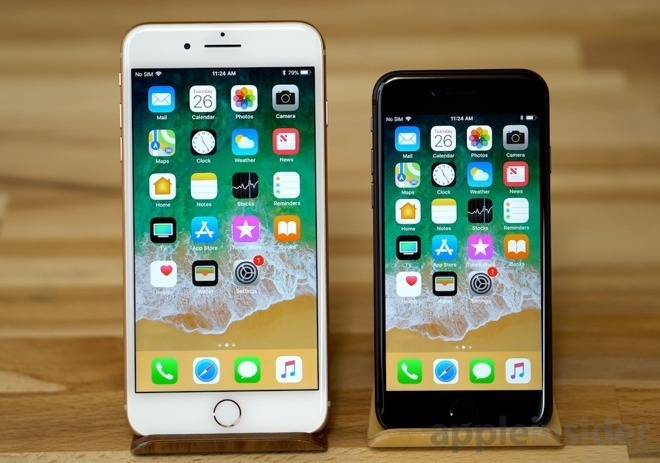 Qualcomm alleged that a wide array of iPhones, up to and including the iPhone 8, were standing in violation of the patent. "Apple has a history of infringing our patents," said Qualcomm's executive vice president and general counsel Don Rosenberg. "While we disagree with the Mannheim court's decision and will appeal, we will continue to enforce our (intellectual property) rights against Apple worldwide." Apple did not issue a new statement on the matter, but pointed to a previous statement on the matter, issued after the Dec. 20 ruling. "Qualcomm's campaign is a desperate attempt to distract from the real issues between our companies. Their tactics, in the courts and in their everyday business, are harming innovation and harming consumers," Apple wrote at the time. "Qualcomm insists on charging exorbitant fees based on work they didn't do and they are being investigated by governments all around the world for their behavior." The ruling on Tuesday has no impact on the previous ban, already in place. The battle between Qualcomm and Apple is unfolding on many fronts. Qualcomm won a ban on some iPhones in China, but Apple believes that a patch to iOS 12 works around the patents in question. In the United States, the USITC has recently declared that it would review retired Administrative law judge Thomas Pender's ruling that Apple infringed one Qualcomm patent, but shouldn't face a product ban that was being sought. The review is in its entirety for the one patent that Judge Pender viewed as violated, meaning that the validity of the one patent will be re-examined, as well as the refusal of a product ban. In that re-examination, the USITC said that it will consider not just if the patent is infringed, but if there are any national security implications in a ruling, and how long it would take Apple to design around a ban or if it already has. The ban ruling isn't binary, and the agency can also consider a limited ban, such as on one version of an iPhone, and not another -- like a ban on iPhones with Intel modems versus Qualcomm ones. Or, it could decide that Pender's ruling is correct, and uphold it. The USITC complaint isn't the only one before the U.S. Government. A U.S. Federal Trade Commission lawsuit was filed before Apple's, and the first ruling from that was issued in November 2018 when District Judge Lucy Koh issued a preliminary ruling against Qualcomm, calling on it to license technology to rivals like Intel. It isn't clear when that trial will end, and details have emerged from it already. Qualcomm's CEO has been saying for nearly a year that the modem chip saga will conclude soon. It isn't clear how accurate that assessment is, with a source within Apple saying that there have been no meaningful conversations between the two companies in months -- a stance recently confirmed to a wide audience by Apple CEO Tim Cook. Desperation, thy name is Qualcomm. Verzweiflung, dein Name ist Qualcomm. One loss at a time finally will turn Qualcomm into total looser. Qualcomm lost Apple business and now Samsung, Intel and MediaTek will provide 5G modem to any phone manufacturer want, in process removing Qualcomm from the equation. Good strategy Qualcomm. They can't "remove Qualcomm from the equation" tho they can replace Qualcomm hardware. The QC IP, some of it standards-essential and some of it not pledged, will still require licensing. Qualcomm will feel the punch to the gut, but licensing accounts for most of their profits anyway. They won't go broke, just battered. Actually they can, but it also means dumping Verizon customer, the only reason Apple and QCOM got into bed together is because Verizon many years ago decided to go non-standard with their cell phone and made a deal with QCOM to be the sole solution for the CDMA which made anyone who wanted to play in Verizon's sand box go to QCOM for the chip solution. This why QCAM has abusive licensing terms its call the only game in town. QCOM now plays in 5G since some of the 5G technology is based on CDMA. This is the technology which QCOM Is being forced to license to companies like Intel. These fee are going to be much lower then their CDMA fees they collect and make up most of their profits. I have personally argued if Verizon want this tech then Apple and others companies should make VZ customer pay all the extra cost for dealing with QCOM. Apple phones should $50 more for Verizon enable phones. The problem is Apple has always had a one price for all model so they did not want to penalize VZ customers. Also, VZ will not allow their suppliers to charge them more for the CDMA tech they help create. QCOM could be come irrelevant as 5G comes along, and apple and other hire away the talent who created the 5G tech and as CDMA dies its slow death QCOM will be reduce to IP licensing house, It may take 5 yrs to happen but this is where it is heading thus the reason they are fighting so hard. A very possible future. Sadly I can see the remnants of QCOM becoming a patent troll that will pester the industry for another decade or two. Actually, there was no standard. If only the FCC had mandated one, but they decided to punt to the phone companies and manufacturers. The same way HDTV is a mess because they refused to force a standard of either 1080i or 720p. No actually they CAN'T. Qualcomm will be one of the largest, if not THE largest contributor of patents reading of 5G. Others are Samsung, Huawei, Ericsson, Nokia etc, the regular gang. In fact Nokia alone says they're entitled to at least $3.50 per handset. SEP's aren't getting cheaper. You actually forgot about Nortel IP (now owned by Apple and gang) and the Motorola IP (now owed by Google and gang) They too had a lion share of the 5G technology. Yes we getting 5G today but much of the framework and IP was developed a long time ago, those patents will be running out so QCOM needs to squeeze as much out of it as they can now. So there will be a lots of hands in pie trying to get their fees, CDMA it was all QCOM, 5G it a number of companies and Apple owns some of it, and there is a think called cross licensing and Apple gives theirs away so they do not have to pay others. This is how it works. The only ones paying the full bill are those who do not have any IP skin in the game. Actually if you thought about it, the radio technology really have not effect on your calling someone one. All call go back to land lines before they go back out to another customers on a different network. all the Fiber and copper communications are controlled by a set of standard thus the reason it all works. The only time the cell radio makes a difference is when you go to place which does not use your radio technologies. I remember going to another country like Japan and having to get a burner phone just to have cell phone in country. But the FCC can not control what other countries do.